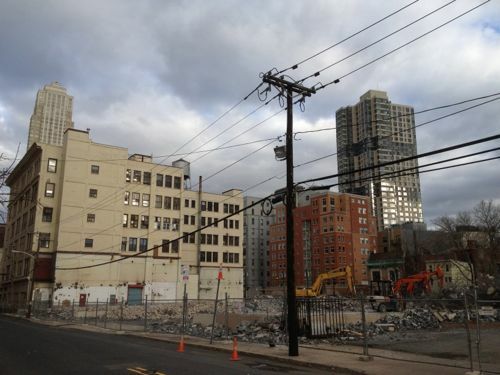 Just in time for Passover, Jersey City’s former matzo baking Manischewitz factory is finally meeting the demolition man. One of the long vacant retail spaces in the base of the Waldo Lofts on Second Street is finally filling up. K9dergarten, a dog day care and boarding facility is setting up shop offering the usual in puppy pampering for absentee moms and dads. Downtown watering hole PJ Ryan’s has changed things up and is now operating as O’Hara’s Downtown. Supposedly not much else is changing. The Powerhouse Arts District Neighborhood Association held their third annual neighborhood BBQ and street fair on Saturday. The event included live music and arts and crafts vendors as well as local shops like d.e.e.n selling their wares. The old loading bay served as a perfect live act stage for a mostly on pitch performance.